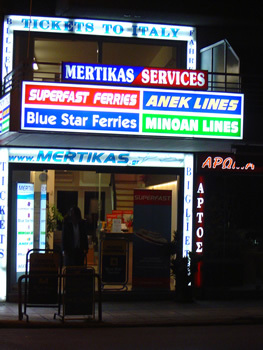 Mertikas Shipping & Travel Agency operates in the shipping & traveling sectors since 1979. The office is located at Patras port opposite gate 7. The services that are provided to customers are divided into the shipping market and the tourism field. As a shipping agency, our office represents the interests of the shipowners for their vessels calling at Patra's port or nearby ones, acting as ship agents. Moreover, bunker supply & lubricants are available at Patra's port or nearby ones. The tourism field includes ferry tickets from Patras or Igoumenitsa to the ports of Ancona, Bari, Brindisi, Venice in Italy. Also, from the ports of Italy to Greece. The companies that we represent are Superfast Ferries, Blue Star Ferries, Anek Lines, Minoan Lines, Maritime Way and Med Link Lines. Camping on board available for all companies. Furthermore, tickets to all the greek islands with greek ferries. The companies that we represent are Minoan Lines, Blue Star Ferries, Anek Lines, Hellas Flying Dolphins, NEL Lines and G.A. Ferries. Also, airplane tickets to all over the world with Olympic Airways, British Airways, Air France, Al Italia, KLM, etc.